Police chief Michelle Pretorius whose Christian faith has given her an unusual perspective on crime in South Africa. Sophiatown, a notorious area of Johannesburg, South Africa, has been known as a very dangerous place — especially for foreign visitors. The street language in Sophiatown has a word to describe this neighbourhood: kofifi. This term means: ‘a place of darkness and despair.’ Alcohol-related assault has long been Sophiatown’s chief problem. North Vancouver-based video producer Stuart Spani was in Sophiatown recently, and learned of a community-wide transformation — which, he believes, is a direct result of the deep Christian faith of several South Africans. Most notably, some of those Christians belong to Sophiatown’s police force. One of the more remarkable people Spani encountered was Michelle Pretorius. 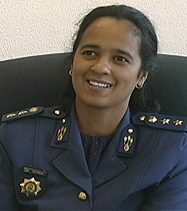 A 16-year veteran of the South African Police Services, she became senior superintendent in Sophiatown two years ago. Her precinct was classified as a ‘crackdown station,’ reflecting the exceptionally high crime rate — the second highest of 21 precincts in Johannesburg. Since Pretorius took charge, the crime rate in her area has dropped to the second lowest in the city. How did this happen? 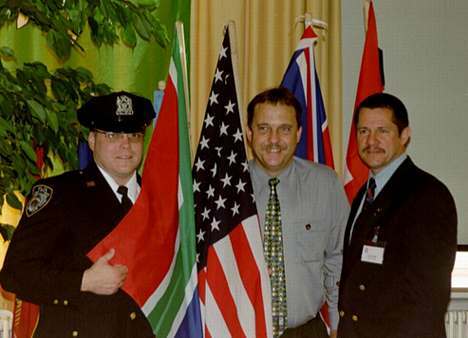 Why Duvenhage (centre) and Quintus Smit of South Africa's Christian Police Association (CPA), with a Christian police officer from New York City -- at the International CPA conference held in Germany in November, 2001. Pretorius told Spani the key reason is that the majority of the police officers in Sophiatown are committed Christians. Hers is indeed a police station with a difference. Pretorius and her fellow officers have regular prayer meetings. There is a prayer room immediately under the holding cells, and everyone entering the department — both criminals and victims — is asked if they want prayer. The station has a ’24-hour Prayer Watch,’ where members of the community come to pray for the police. Crime reports and the names of the police officers are posted in this room, and the prisoners in the cells can hear the prayers. People often drop in from the street to pray. 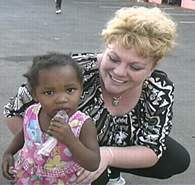 Ria Van Rensburg, of 7 Trumpets Ministry, with a neighbourhood child in Sophiatown. “Something that never ceases to amaze and thrill me is how God uses very ordinary people to accomplish extraordinary things,” says Spani. As a case in point, he cites Amanda Pyper and Ria Van Rensburg. In addition to preaching outdoors in the neighbourhood twice a week, Pyper and Van Rensburg continually visit Sophiatown’s many apartment blocks and refugee camps, offering all types of assistance. They have been instrumental in organizing committees which keep the neighbourhood free of garbage, and which report and prevent crime. Through their 7 Trumpets Ministry, the two women have been key factors in opening a Christian coffee shop in the police station; organizing the teams who pray in the station; raising money from local businesses and individuals to purchase 15 bicycles for the police; and spearheading an ‘Adopt a Cop’ campaign, which encourages individuals or churches to choose individual police officers and constantly hold them up in prayer. Van Rensburg believes a police station should be seen as a lighthouse in the community, where people can find more than solutions to their problems. Convinced that a devout Christian police chief would make the crucial difference, Van Rensburg and Pyper prayed for three years that Pretorius would be placed in charge in Sophiatown. The Christian Police Association (CPA), based in Wynberg, is also helping to make a difference in South Africa. In a recent issue of the monthly Good News for the Police newsletter, CPA president Why Duvenhage wrote: “We have changed from a small fellowship into a dynamic Christian movement within the criminal justice world — not only in South Africa, but all over Africa and other parts of the world. Duvenhage cited a particularly memorable sight at the most recent CPA national congress. “I had a glimpse of heaven! I was looking through the raised and praising hands of saved police officers (CPA members singing ‘How Great Thou Art’) to the person on the stage. CPA coordinator Fanie Van Vuuren told Spani that he shares Duvenhage’s conviction that a revival will start in the South African Police Service and then sweep around the world. And victory in this particular battle may indeed be coming. Just before BCCN went to press, Spani received an email from Colleen Hawes, president of the Association for Prevention of Crime in Johannesburg.